Be active, be outside, make a difference you can see. Volunteers are needed mostly right out on the trail. There are also some "behind the scenes" opportunities at our office and projects suitable for a home workshop. See below for already scheduled projects. Or contact us about helping at other times. CVTA is happy to partner with Green Mountain United Way to put on volunteer opportunities for all abilities. Spend a morning or afternoon this weekend getting your hands dirty. Everyone is welcome. Plenty to do for all ages and abilities. First time? 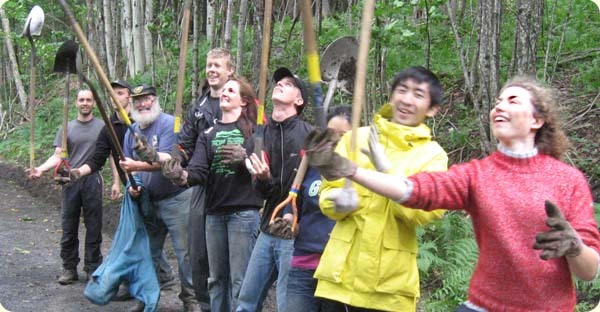 Read our "What you need to know before attending a volunteer work party". Meeting times: We'll meet at 9 AM each day, and you can stay as long as you like. (Projects generally are near the road, so you can park nearby and leave when you need to, or stay all day!) If you'd like to drop in at a later time, give us a call ahead of the work day and get directions to the project site. If a project has a different meeting time, that will be noted in the calendar listing here. Johnnie Brook Trail, Richmond We're rebuilding the rest of the Johnnie Brook Bridge - come on down, we'll have plenty of carpentry tools on hand. Blue Mt Union Help with the big upgrade of the rail trail in Wells River. Help needed planting trees, and other trail improvement tasks. Meet at 10 AM, or call ahead to find out where we'll be if you want to meet us later in the day. Blue Mt Union Help with the big upgrade of the rail trail in Wells River. Help needed planting trees, and other trail improvement tasks. Meet at 9 AM, or call ahead to find out where we'll be if you want to meet us later in the day. East Montpelier Catching up on some trail maintenance on trails in East Montpelier. Call for location. Schedule your own work party. CVTA staff can work with you directly on a day that is best for your program. Already have some skills and want to be in charge of your own spot from start to finish? We can set you up with some blank canvas to work with on your own time. Spend a full week (or three!) camping out with us completing a large project. More Information. Local folks are welcome to join in on the projects for as little as a few hours. Give a call to find out where to connect with the crew each day. American Hiking Society Marshfield, Groton and Newbury. Trail work in Groton State Forest and on state owned portions of old Montpelier - Wells River railbed. Volunteers for Peace Statewide. Help improve local trails all along the Cross Vermont route. Is there a section of the Cross Vermont Trail that you especially enjoy visiting? We can set you up as an official adopter who helps keep tabs on the trail, making it ship shape. CVTA Trail Maintainers Guide (PDF 553KB) is an introduction to the basics of helping to take care of a section of the Cross Vermont Trail. Design and prep in your shop wooden bridges for assembly out on the trail. Engineer, Lawyer, Accountant - or studying to be one? Your volunteer work "under the hood" of the CVTA will ennable us to get more done on the ground. Sit in a lawn chair outside on a sunny day! We are looking for folks to spend some time at trailheads, counting the number of users on the trail. It's our contribution to the National Bicycle & Pedestrian Documentation Project (the NBPDS). (We're also set up to gather data compatible with the trail use counts already being done by VTrans at some heavily used sites, such as the Montpelier Bike Path by the Dept of Labor Parking lot, rest assured.) Ready? The basic idea is to do a number of counts, then average them to provide one "usage number" for that trail, for that time of day, for time of year. Each set of counts should be: 1.) at the same location 2.) at the same two hour block of time (such as 11 AM to 1 PM or 5 PM to 7 PM) and 3.) be carried out on three weekdays and three weekend days, either all in one week (consecutive days Tues through Sun) OR do one weekday and one weekend day per week for three consecutive weeks. Then, the raw numbers are plugged through a formula provided by NBPDS to calculate an "average users per day" number that has (some) validity. Got it? Wanna help? Give a call! Already helping and need another copy of the tally sheet? Here it is: CVTA Use Count tally sheet. Collating papers, stuffing envelopes, idle conversation around the folding table - sound calming? We occasionally have such get togethers.